Angus has a home! 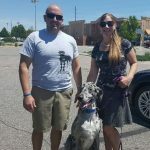 - Rocky Mountain Great Dane Rescue, Inc.
Angus has a home with Jay & Kira in Franktown, CO. Angus will be going to a home who currently have a Great Dane named Jaxon and 2 cats…Darwin and Lewis. Jay and Kira are no strangers to having Great Danes. They are usually always home so their fur kids will have lots of undivided attention. They like to include their dogs on walks in the neighborhood and hikes in the hills on the weekends. Way to go Angus!! !